From Salem to Washington DC, we can lift our voices to create the loving, safe and compassionate world we seek to dream into being. This week we have the opportunity to speak out against gun violence in Oregon, to stand firm against sexual harassment throughout our nation’s schools, to support those from other nations whom we have already pledged to protect AND to JUST SAY NO to this horrific federal government shutdown. And today we are delighted to share that our Interfaith Service will resume on Tuesday, February 19 at 7 PM at Grant Park Church, 2728 NE 34th. Pastor Jeremy Richards is excited to welcome us there, as a primary mission of the church is to open its doors to community activity. We are very excited to reconnect in prayer, and we hope you can join us! There is ample parking in the lot across the street, a ramp to the front door (there are two front doors, please use the one on the right) and we’ll start out in a cozy space. Once we are large enough we can move into the sanctuary. Blessings to all, as the days visibly lengthen and our legislative session begins. May 2019 be a year of the visible expansion of justice! Join ‘Lift Every Voice Oregon’ for their 2019 Legislative Kick-Off Rally to Support Important Gun Safety Bills! The 3000 member strong Lift Every Voice Oregon Campaign will introduce two bills to the 2019 Oregon Legislature to promote public safety through banning the sale of assault weapons and large capacity magazines in Oregon! Horrified that the Trump administration and that Senate Majority Leader Mitch McConnell are holding 800,000 Federal workers hostage for their racist, useless border wall? While we will rarely forward simple petitions to you, this month we feel compelled to do SOMETHING about this travesty. 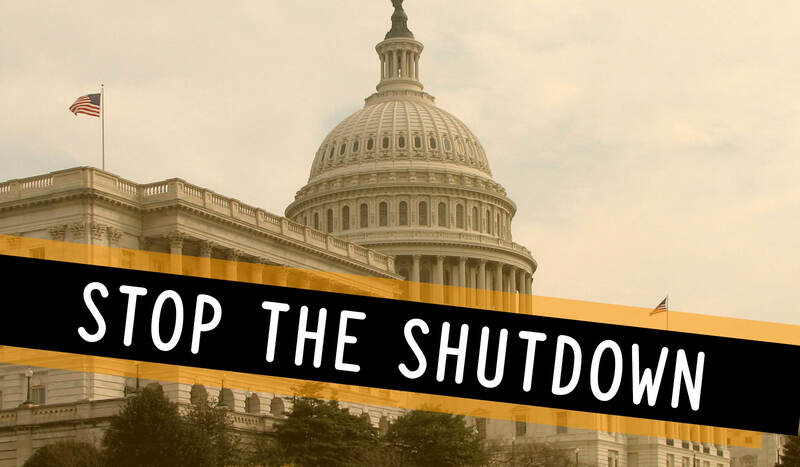 Sign here to send a message to Trump and McConnell to end this heinous shut down! SpeakOut Against the Administration’s Normalizing of Sexual Harassment in Schools! Join us in submitting your comments opposing the Trump administration from rolling back hard won civil rights victories in Title IX protections for survivors of sexual harassment and assault! Help ensure that survivors are not unfairly burdened and help keep schools safer. You have the opportunity to personalize your letter, so if you are a clergy person, therapist, lawyer, activist or survivor or someone who helps survivors, be sure to add your wisdom to the mix! To learn more about the issue, here is an article you might find helpful! Click here and do your part to protect students and our values! It is critical that we remind our new Congress that dreamers, Temporary Protected Status (TPS) recipients, and Deferred Enforced Departure (DED) holders are in urgent need of a permanent, legislative solution that provides a pathway to citizenship without undercutting other immigrant community members. In response to violence, conflict, and natural disasters, the U.S. government pledged to protect individuals from impacted countries already in the United States with TPS or DED. Today, thousands of our community members have been able to rebuild their lives, work, and raise a family in safety, while their remittances support loved ones in their home and neighboring countries. Faith Leaders: Sign On Today!